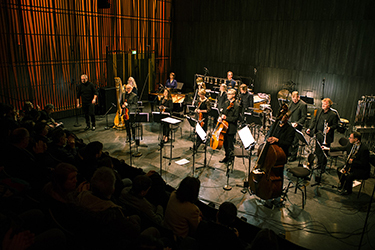 In the case of Rounds (being heard for the first time in a revised version) by one of Iceland’s most renowned composers Haukur Tómasson, the notion of the envelope – the way a sound begins, develops and ends – was being explored. It posed the question of, within this group context, what constituted a ‘sound’, which Haukur’s music suggested was not about individual instruments but the product of many combining to form communal sonic entities. This was initially reinforced by having each one of these entities conclude with a loud pizzicato accent like an unequivocal full stop, followed by a pause. As the piece developed it posed the additional question of what makes a sound into an idea – and indeed whether a sound can itself be an idea. This was provoked by the highly gestural nature of the material, forming something like swatches of sharply-defined patterned fabric that, over time, Haukur arranged into a patchwork, such that the joins were often sudden but clearly part of a bigger overall design. Though a touch superficial, Rounds was certainly enjoyable while it lasted. Gunnar A. Kristinsson‘s Rætur [roots], a world première, took inspiration from that most elemental of things, the overtones of the harmonic series, explored in three movements, each of which upped the microtonal ante. The first was the most clear in terms of the relationship between the tones and the fundamental, gentle floating pitches emphasising the major tonality arising from lower harmonics. In the second, the music lived up to its title by having multiple harmonic roots, cycling round different tonal centres with microtonal lines emerging from them and spiralling upwards. Embellished with bells, the cumulative effect was not unlike a rising Shepard tone, always ascending while ultimately remaining in (or, at least, returning to) exactly the same place. The final movement reversed direction, microtonal lines playfully falling to the accompaniment of bongos. The fundamental was now lost, making this the most harmonically inscrutable of the three – yet an unexpected low staccato piano note at the very end of the piece cheekily suggested that here, finally, was the root we’d all been looking for. A superb piece that encompassed serenity and mischief, Rætur continually forced one to reflect on exactly what we were hearing and how different notes may or may not have been related to each other. 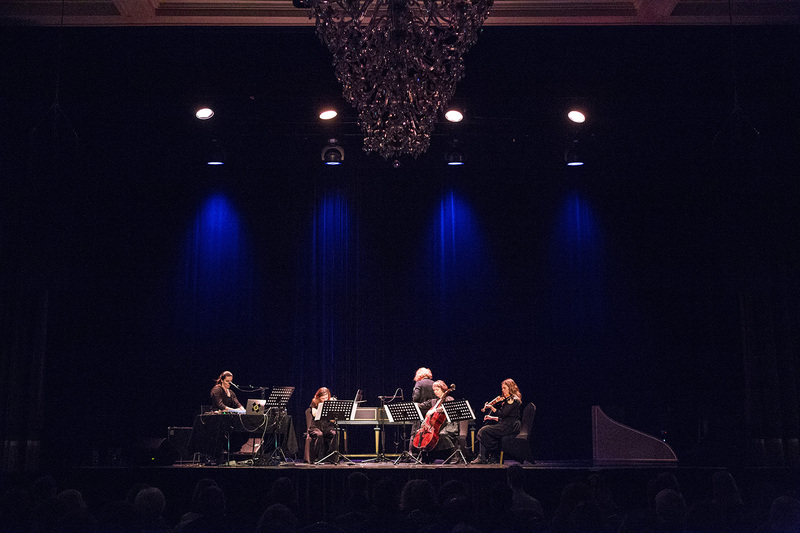 The most enigmatic work in the concert was Lucidity by Páll Ragnar Pálsson, receiving its first performance in Iceland. In hindsight the title was cleverly-chosen, presenting a paradox: it implies comprehensibility and clarity, yet the word’s reference to light, which was paramount in Páll Ragnar’s material, nicely proved to be a whole lot more elusive. The music was volatile, turbulent and effervescent, evoking the sensation of continually shifting light conditions. If the piece was lucid at all it was in occasional episodes where for a time everything stilled, yet more often the material glistened as if with fleeting shards of reflected light. Like trying to handle mercury or catch hold of water, this was quicksilver music that one could fleetingly glimpse before it slipped sideways to become something else. For the final work in the program, another first performance, Hugi Guðmundsson used one of the most immediate but neglected punctuation marks as his title, the interrobang: ‽. In many respects, that title was the work’s most dramatic element. From the outset, it sounded as if a primary element was missing – until it suddenly hit me that what we were hearing was like a kind of 21st century Façade, which maybe meant the piece was not so much a song without words as an accompaniment without a reciter. That didn’t stop its abrupt gear shifts between being playful, wistful, impish and mysterious from sounding rather charming and characterful (there were some lovely orchestrational touches), but they simply never felt as if they were conveying the whole story. Perhaps some stanzas of Edith Sitwell might have made all the difference. 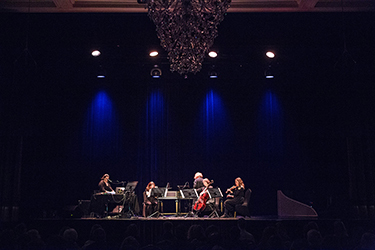 The day ended down the road at the Gamla Bíó, Reykjavík’s old cinema, for a late evening performance by the mouth-watering combination of the ensemble Nordic Affect – Halla Steinunn Stefánsdóttir (baroque violin), Guðrún Hrund Harðardóttir (baroque viola), Hanna Loftsdóttir (baroque cello) and Guðrún Óskarsdóttir (harpsichord) – with composer-performer Maja S K Ratkje. Ratkje’s work Rökkur [twilight] was divided into two 30-minute halves. The first opened with an introduction that from anyone else i might have called tentative (nothing Ratkje ever does is tentative), a quietly demonstrative collection of lower-case squeaks, scrapes, scratches, thuds, clunks and tinkles set within a highly reverberant soundspace. This bewitchingly established the atmosphere for a remarkable sequence that followed: Ratkje sporadically enunciating words while the ensemble offered pizzicati and swishes from the strings and occasional trills and twiddles on the harpsichord. That description in no way lives up what it evoked: a spellcasting recitation, the ensemble’s actions an integral part of the conjuring. What emerged into the space brought to mind something of the aesthetic of director Panos Cosmatos, a mixture of high gothic and mysticism seemingly coloured deep crimson, Ratkje vocalising over networks of shivering pitch bands, receding to high violin whistles and harmonics, like streaks of incense blown horizontal by the wind. Eventually, a ghostly apparition manifested in the form of askew, quasi-Baroque counterpoint, culminating in a setting of George Herbert’s ‘Love bade me welcome’. Where the first part had been ritualistic and solemn, the second part was more expressively free, not directed towards a specific intent or purpose but unfettered, capable of spontaneous exuberance. For a time the music became transfixed in an irregular cycling chord sequence, as if dancing on the spot, until everything became subsumed in electronic turbulence that continued to grow and coalesce. Though unsettling in the wake of what had preceded it, it nonetheless came to feel completely glorious, like some form of elemental entity arising out of the earth (in response to the spellcasting? ), emitting black radiance. It was literally overwhelming, Ratkje’s voice growling and cracking, the music made both childlike and sinister through a simple cowbell. Clarifying into a drone with a granular surface, this acted as a trigger for the ensemble, causing the electronics to vanish. As the dark magic faded, it was replaced with faint instrumental actions, fragile figments of half-lost and -forgotten ideas or memories. Ratkje suddenly injected a huge amount of vocal energy, briefly leading to final burst of momentum and density, but this too faded, the ensemble concluding Rökkur with an instrumental reprise of the George Herbert song, the melody line doubled by Ratkje with the most genuinely uncanny, theremin-like whistling. This was music-making of staggering brilliance and imagination, made all the more emotionally vivid and authentic due to the performers evidently being quite relaxed and the music having a slightly rough around the edges quality. At the end, i didn’t want to leave the Gamla Bíó, i wanted to stay and bask in its afterglow, savouring the dying embers and echoes of the magic that had been made.